I had not planned to see Gua Bama. 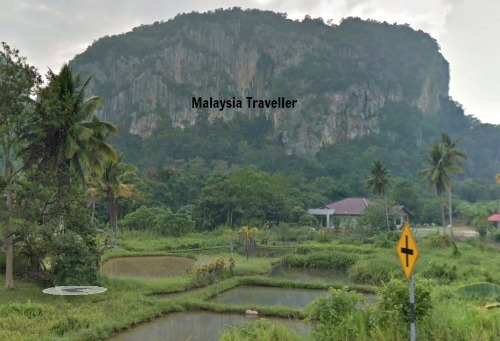 In fact I had never heard of it until I saw the brown tourist sign while driving on the Central Spine Road from Gua Musang to Kuala Lipis in Pahang. Since the sign indicated that it was only 500 metres away I made a quick detour to find the cave. 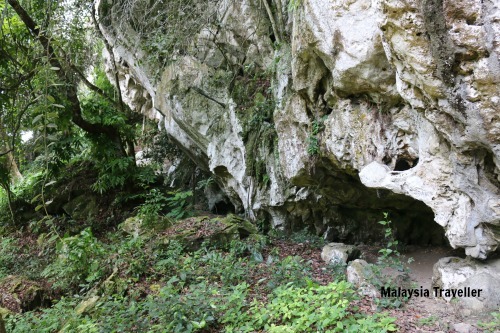 The side road took me to the foot of a limestone hill and I could see a wide cave-like opening in the side of the hill. I parked next to a suspension bridge crossing a muddy stream. The bridge was in very poor condition with several of the wooden planks missing or about to break. I was concerned that the planks would not be able to support my weight so I hooked my camera over my shoulder and grabbed the metal cables with both hands and tried to avoid the stepping on the middle of the planks. I made it across but unfortunately I snagged my camera against the side netting and my lens cap dropped into the river below. I then wasted several minutes trying to find ways of getting my lens cap back without getting soaked, but failed. Presumably it is still there. After that I was not in the mood to explore the area fully. I saw a couple of cave openings but did not manage to see the main cave. I have since found out that it is accessed by a flight of concrete steps. It is a large circular chamber in which archaeological remains have been found. It contains a lot of bats and cockroaches. If you do a Google search for Bama Cave you will find most results refer to a much more famous cave with the same name in China. 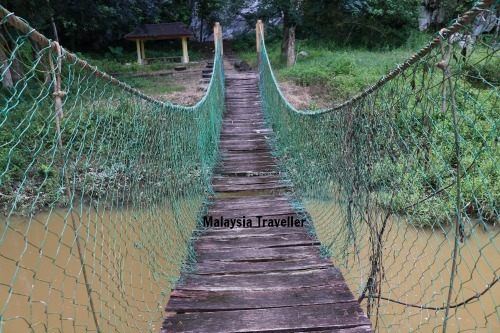 Take the Central Spine Road (Route 8), the road which links Gua Musang to Kuala Lipis. 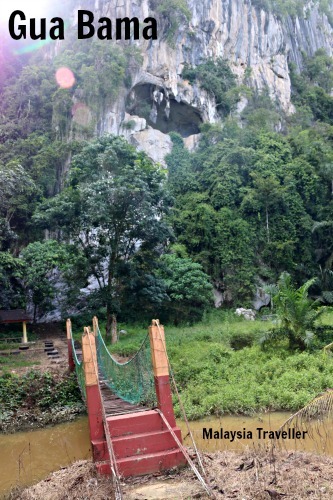 You can clearly see the hill in which the cave is located when you reach Kampung Relong, about 15 km from Kuala Lipis. Here you will see a sign pointing to the cave. It is about 500m from the turn off. Open daily. No fixed opening hours. The nearby town of Kuala Lipis is worth visiting especially if you are interested in historic heritage buildings. You can read about it on my Kuala Lipis Walking Tour page.